This article was first published in The Malay Mail. 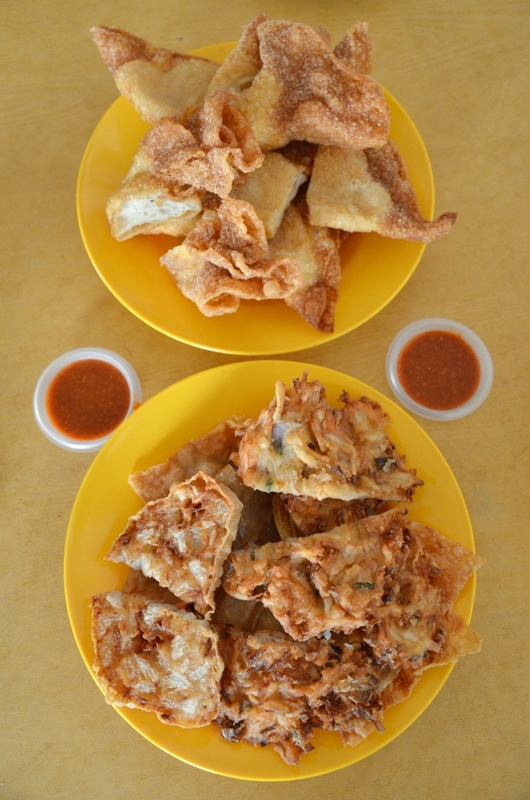 This carrot and onion fritter is one of Merindy Restaurant’s signature item; the other being the Ipoh famous sar kok liew. The beauty of waking up on a beautiful Saturday morning in Ipoh is the thought of a thousand and one breakfast options (figuratively speaking, but who’s counting? ), all lined up for you to choose from. Nestled deep within the neighbourhood of Taman Mirindy, in a relatively more serene part of the Kampung Simee suburb in Ipoh, is this undiscovered (at least that would be my assumption for most visitors and a large majority of the locals) gem of a coffee shop aptly named Merindy Restaurant. At the other end of the same row of shophouses is Moon De Moon Restaurant, housing an immensely popular curry noodles and kai see hor fun (Ipoh style chicken kuey teow soup) stall. The wait for a bowl of noodles at Moon De Moon can be an excruciating 30 minutes on average, sometimes even up to an hour! 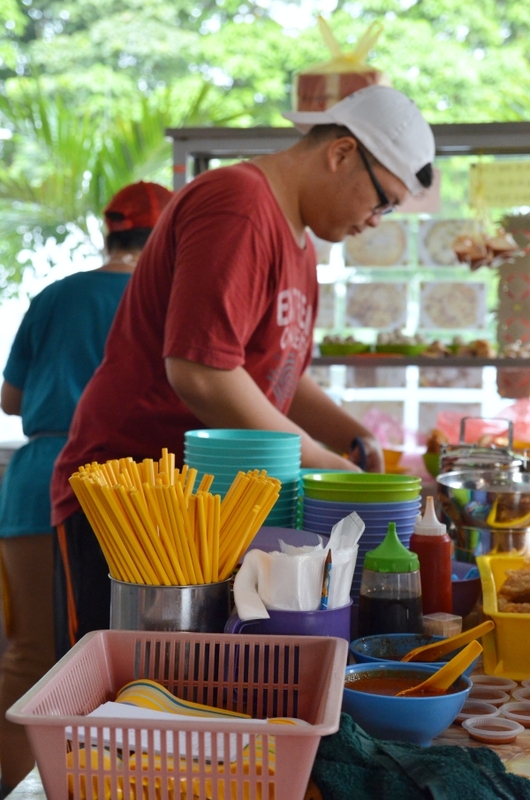 The team seemed to be a well-oiled machinery; churning out bowls after bowls of noodles with gusto, and even engaging in friendly banter with the customers; presumably loyal fans. Hence, don’t despair if you cannot grab a seat even with tables placed on the sidewalk and out in the open. Walk to the other end of the same row of shophouses and I will tell you why. At Merindy Restaurant, the set-up appears to be simple. A typical neighbourhood coffee shop that is bright and airy, with a television set hanging from the wall showing classic TVB dramas to occupy your attention while you tuck in to the food, and only a couple of stalls serving Ipoh hawker fare. The most prominent is the fish ball noodle stall (also known as liew fun in Cantonese to the locals) fronting the premise; one that is not a new kid on the block but with extensive experience in the business for more than a decade. However, after 11 years of service, they took a break for a few years and only came back to the scene about a year or so ago. There are dozens, probably hundreds of liew fun stalls in Ipoh. But what makes this stall so special? The draw is their sar kok liew, a type of jicama/yam bean fritters, a savoury snack well-established among the locals and an almost compulsory item to pick whenever you are having liew fun in Ipoh. Crispy beancurd sheet wrapping a sweet and juicy mix of cubed yam bean or sar kok, is paired with the stall’s piquant garlic chilli sauce sourced from a local kuey teow maker. The sar kok liew here is served piping hot and fresh from the wok, making it irresistible. 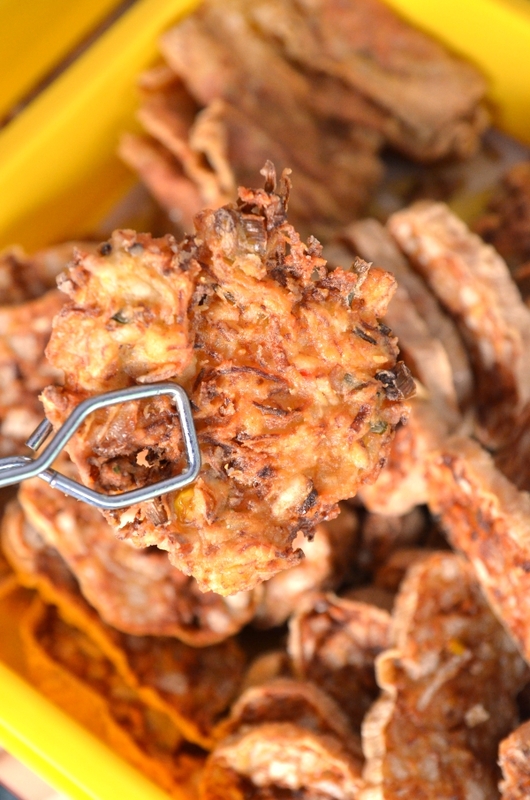 Another item that won our hearts was their signature carrot and onion fritters; a close resemblance to cucur udang or prawn fritters, but without any meat. At first glance the fritters appear somewhat over-fried with burnt edges and not looking as “refined” as their other pieces of work. However after one bite, we instantly fell in love with this simple, savoury and sweet creation. The finely julienned carrots and onions lent the snack a slight sweetish aftertaste, while the crunchy batter tied the ingredients together. Definitely a must-pick if it’s available. The deep fried items here were generally rather tasty. Their fried sui kow dumplings were packed with bouncy fish paste and finely diced carrots. Thankfully the dumpling skin had none of the overpowering alkaline water (kan sui) taste. I have to admit that I am slightly biased towards anything fried, and only sampled some of their lighter boiled items like stuffed bean curd (tau foo) and stuffed pig’s skin with fish paste. Interestingly, the bean curd was not stuffed with the usual fish and pork paste, but this was a darker, salted fish infused minced pork paste that reminded me of those classic Hakka cuisine places. The bouncy, gelatinous stuffed pig’s skin was not bad either. It’s not an item that is very commonly sold by other liew fun sellers nowadays. 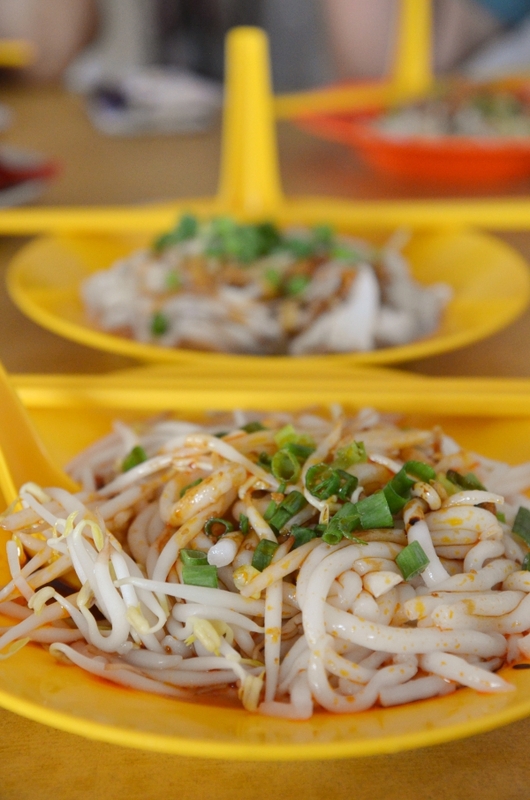 And to accompany the various stuffed items mentioned above, try their Hakka mee with a delightful minced pork gravy, plump Ipoh bean sprouts and springy flat rice noodles. Craving for a tad more punch, I opted for the dry curry lou shu fun (also known as rat’s tail noodles or silver needle noodles), which was passable. 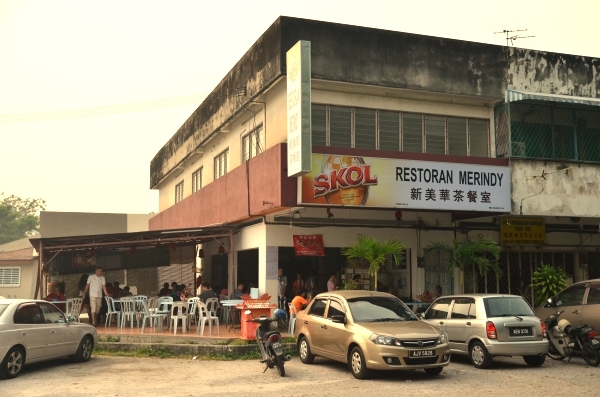 It is no match to Moon De Moon’s wildly-popular version but Merindy Restaurant’s version has the delectable array of side items. The stall opens early in the morning from 7am or so, and usually their food is sold out by lunch (before 12pm). The restaurant is still open beyond that, and sells various individual rice or noodle dishes. Off-days are not fixed, but they usually close on a consecutive Tuesday and Wednesday every month. It’s hard to find good authentic Ipoh food in KL. Wish our water and chicken were as fresh! 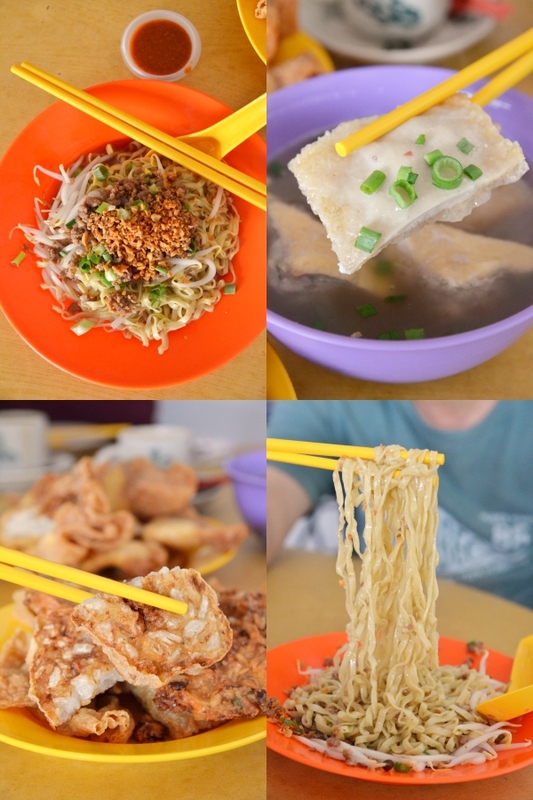 Great write-up and nice photos as always … Can’t wait to visit Ipoh again over CNY! Usually your recommendations are rather good. This time, very far off the mark. The liew is lousy, the soup is tasteless. My 1st & last visit. 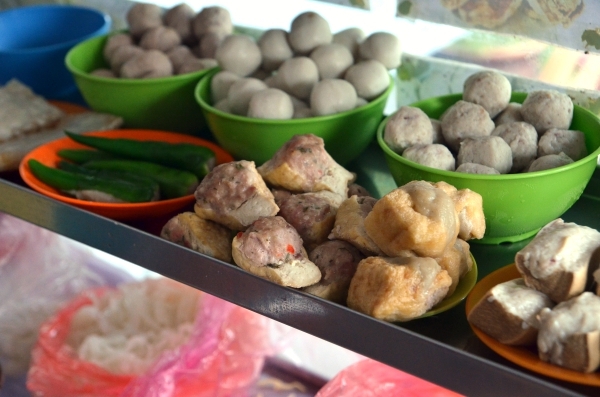 The fish balls & pork balls from packet. The fried liew very hard & oil not fresh. Not up to Ipoh standard at all. The liew fun in Simee market much better. Even K10 liew in the morning at Medan Ipoh is better. Very nice photos of delicious food. This looks amazing! Great ethnic dishes! Everything looks so amazing and delicious, great post. Seems like a Lovely Place . All the Best . The Food Looks Awesome and Tempting . so delicious and yummy food. this has made me so hungry. i want to eat these foods. I never been to Ipoh before, so I decided to find some food bloggers who can fulfill my needs to eat when touring at Ipoh. You really gave me the information that I needed for food. Thank you. nice blog post and your experience always important for me, me too a traveler and every month going for new place so this info very effective for me. thanks for sharing. This food looks amazing! Wish we could eat this locally in Vienna. Wonderful photo delicious food. Thank you for sharing.